Mia (Emma Stone) is an aspiring actress. She works as a barista on a movie studio. She doesn’t like her job, but it pays the bills until she gets her big break. By chance one night, she wanders into a bar where she heard someone playing piano. Sebastian (Ryan Gosling) is a jazz pianist. He is currently earning a living by playing Christmas songs at a restaurant. Bill (J.K. Simmons), the restaurant owner has warned Sebastian to stick to the playlist and not play any of his brooding jazz. One night, Sebastian can’t help himself, and starts playing what he loves and is fired on the spot. After running into each other a few times, Sebastian finally asks Mia out. Over time, Mia and Sebastian develop a relationship. Things are getting serious when their lives hit a turning point. They must decide whether to choose to follow their dreams or stick with the relationship. 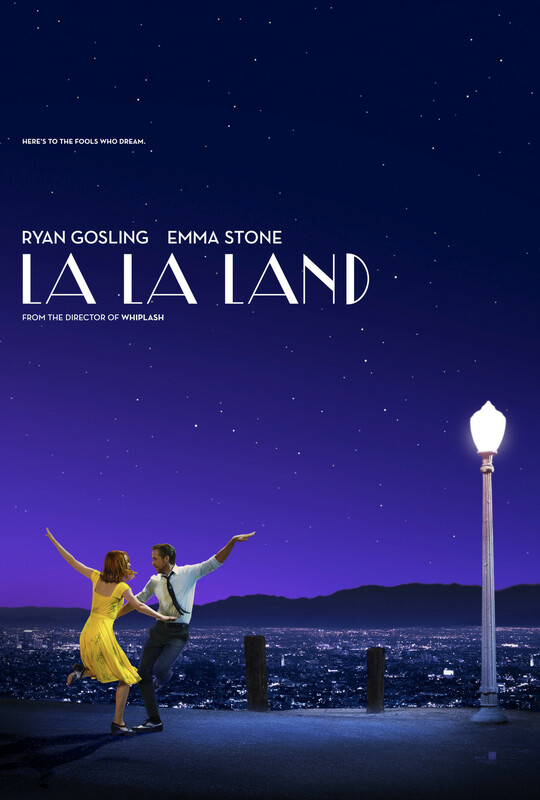 La La Land is a refreshing take on the musical. While there are moments where the leads break into song, it isn’t dominated by these spontaneous outbreaks into song. Instead, much of the musical aspect is in the form of instrumentals, with the characters breaking into dance. The film has an old-timey feel, like musicals from long ago. Emma Stone and Ryan Gosling, having only starred together in a handful of films, have shown that they can have great chemistry. This is most notably demonstrated in Crazy, Stupid, Love. Pairing up again, the duo shows they can work in almost any genre. Musicals can be challenging to pull off, but Stone and Gosling do surprisingly well. They are naturals in the material, balancing each other in their parts. The story isn’t as predictable as I originally thought. The story has an interesting cadence. As one scene seemingly transitions to the next, the film doesn’t always progress in chronological order. Writer/director Damien Chazelle uses flashbacks, alternate perspectives of the same scene, among several other storytelling techniques to make what could have become a very bland movie more interesting. Layer that with a compelling soundtrack and excellent cinematography, and you end up with a mostly well-crafted film. My one complaint about La La Land is that it clocks in at a lengthy 2 hours 8 minutes. And it feels every bit that long. If Chazelle had cut it down to somewhere below the 2 hour mark, I would have scored it a little higher. As it stands, it is a more refined approach to musicals than we have seen in some time and is still quite enjoyable. It would make for a good choice for a date night, whether in the theater or waiting for the rental.